Are you thinking about remodeling your kitchen? Curious as to whether or not you can afford such a project? While kitchen remodels are certainly on the expensive side, they not necessarily unmanageable. To help you understand what you’re up against, we’re going to provide a thorough answer to the question of “how much does it cost to remodel a kitchen?” Ready? Let’s begin! The cost of your kitchen remodel will depend on a number of factors. Not only will it depend on the type of work you’re looking to have done, but on the materials you use, the services you use, and the appliances you purchase. However, there are statistics available, and they indicate that the average kitchen remodel costs around $23,000. Whereas the average low-side for a kitchen remodel sits at around $12,500, the average high-side for a kitchen remodel sits at around $34,000. In short, a kitchen remodel is a big investment. It’s akin to buying a car, or a boat, or some other type of expensive entity. Curious as to what the different aspects of a kitchen remodel will cost on an individual basis? Read below to find out. Generally, the most expensive aspect of a kitchen remodel is the cabinets. Cabinets are not cheap, going for anywhere from $50 per square foot to $1,250 per square foot. You can expect to pay anywhere from $1,000 to $10,000 on just a cabinet replacement. All things considered, you should plan on spending around 30% of your budget on cabinets. The next most expensive aspect of your kitchen remodel will be appliance acquisition. Refrigerators, oven ranges, dishwashers, and the like are quite expensive, and will generally make up around 15% of your total expenditures. You can expect to pay anywhere from $1,000 to $10,000 on new appliances. New counters will probably cost you between $1,000 and $5,000. Of course, this will depend largely on the material that you choose to use. In the end, you should plan to set around 10% of your budget aside to account for counters. Kitchen flooring usually costs between $1,000 and $5,000. The amount you spend will be largely dependent on the material that you choose to use. For instance, while laminate will be on the low end of this range, stone will be on the high end. In the end, you should use around 8% of your budget to pay for new floors. Lighting will usually be around the same price as flooring, taking up anywhere from 5% to 8% of your total budget. Depending on the type of lights that you choose to install, you could end up spending anywhere from $500 to $2,5000. Adding new plumbing entities to your kitchen is going to cost you around 4% of your budget. You can plan on spending $250 to $2,000 on new plumbing entities, installation not included. You may or may not plan on adding doors to your kitchen, but if you do, you should ration out around 2% of your total budget to do so. Doors can cost anywhere from $250 to $100, not including installation costs. If you plan on swapping out your old windows for new windows, you should plan on setting aside another 2% of your budget. Re-windowing an entire kitchen will typically cost somewhere between $250 and $1,000. This is without installation fees included. While it’s difficult to gauge average installation costs, a good rule of thumb is to expect to spend around 17% of your budget on installation services. While you could choose to hire different contractors to perform different tasks, your best bet is to hire a single kitchen remodeling company which can perform all the necessary tasks. If you choose to use a dedicated kitchen designer, you should plan on setting aside approximately 4% of your budget. Kitchen designers can charge anywhere from $50 to $250 per hour. In addition to the costs reviewed above, you should also consider setting aside around 1% of your budget for miscellaneous costs. You never know what might spring up in the middle of the remodeling process. The problem most homeowners have with kitchen remodels is coming up with the money to pay for them. After all, as you can see from above, they’re fairly expensive. There are two general funding options available for kitchen renovation. These include saving money and taking out loans. While it can take a while, for some, the best way to fund a kitchen remodel is by simply saving up money. This method of funding requires a good deal of discipline, as you must refrain from spending your saved money on other expenses. However, because it involves no interest, it’s ultimately the cheapest way to fund your project. If you plan on going this route, it would be wise to open up a separate savings account into which you can store your remodel money. Take a certain percentage of your money out of each of your paychecks and ensure that it ends up in this account. Eventually, enough money will have accumulated for you to get the ball rolling. The most common method of funding a kitchen remodel is to take out a loan of some kind. 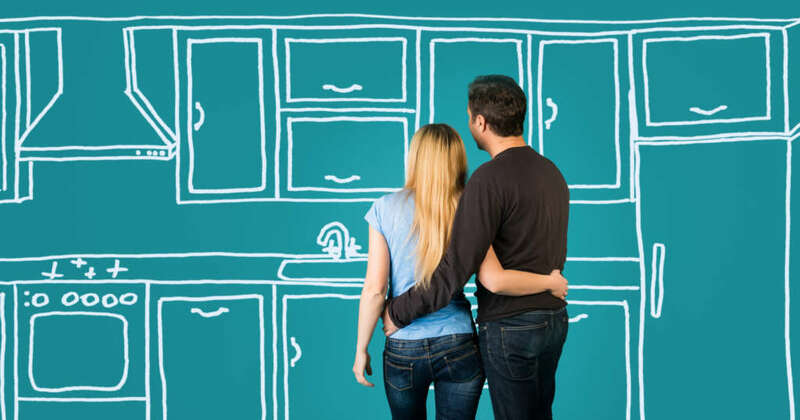 There are all types of loans that can be used to fund kitchen renovation projects, including personal loans, home equity loans, home-equity lines of credit, and more. By using a loan to fund your kitchen remodel, you can get the proverbial ball rolling almost right away. However, be aware of the fact that you’re going to have to pay interest on your loans over the years. Are you interested in remodeling your kitchen? Need a kitchen remodeling company to help you complete the task? If so, and if you’re looking for a kitchen remodeling company in Bellaire, Texas, Levi Homes is the company to call. Contact us today to discuss your remodeling needs!